A classic shirt with added style. Finished with silk, this warm white shirt from Persona by Marina Rinaldi steps effortlessly from office to evening out with its collarless design and understated ruffle front detailing. 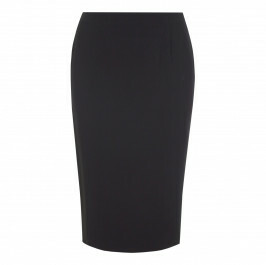 Team with a pencil skirt and heels for an iconic silhouette. Collarless shirt with ruffle detail in off white. 76% Acetate, 24% Silk. Delicate Machine Wash, Professional Wet or Dry Clean.